Attraction rated '5 out of 5' on Tripadvisor from over 10,000+ reviews!!! Warner Bros. Studio Tour London – The Making of Harry Potter provides an amazing new opportunity to explore the magic of the Harry Potter™ films – the most successful film series of all time. Enjoy previously unheard anecdotes from the expert guides before taking a unique walking tour that takes you behind-the-scenes and showcases a huge array of beautiful sets, costumes and props. It also reveals some closely guarded secrets, including facts about the special effects and animatronics that made these films so hugely popular all over the world. 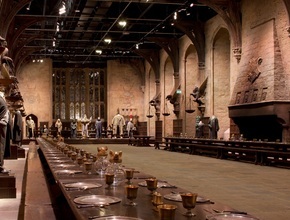 Step inside and discover the great hall. Listen to previously unheard anecdotes. Platform 9 ¾ expansion will open on Thursday 19th March and entrance will be included in the standard ticket price. This March, Warner Bros. Studio Tour London – The Making of Harry Potter will unveil a 20,000ft2 expansion, including the original Hogwarts Express steam engine and a recreation of Platform 9 ¾. The new, permanent section will offer a glimpse into how some of the films’ most iconic scenes were created as well as give visitors the chance to climb aboard the train’s carriage and to pose with a luggage trolley as it disappears through the platform wall. Throughout the Harry Potter film series, British steam train no. 5972, ‘Olton Hall’, was used as the Hogwarts Express. Scenes featuring the working engine – including the very last scene to be shot, in which a grown-up Harry, Ron and Hermione wave their own children off as they head to school – were filmed on a soundstage at Warner Bros. Studios Leavesden and on a track running the full length of the Studios’ 100-acre backlot. The 78-year-old engine will return to the series’ production home this spring and will be displayed on a realistic set of tracks, with steam billowing as visitors step onto the platform. 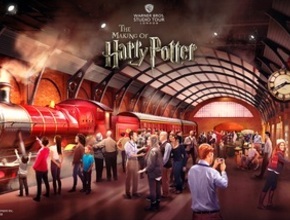 Visitors will be able to walk along the train’s adjoining carriage and sit in the interior carriage set that was used during filming (complete with ‘windows’ that demonstrate the process used to create iconic train scenes from the films such as the escape of Harry’s first Chocolate Frog and the Dementor attack). A selection of prop luggage will be on show and visitors can find out which character owned which items by turning an interactive dial (characters include Hermione Granger, Draco Malfoy, Luna Lovegood and more). A train-themed souvenir shop will also be open on the platform, stocking a wide range of goodies inspired by the Harry Potter films and, specifically, the Hogwarts Express. The Forbidden Forest may be strictly off-limits to Hogwarts students, but for the first time this March, visitors to Warner Bros. 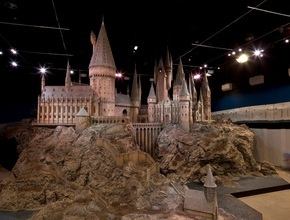 Studio Tour London – The Making of Harry Potter are invited to defy Professor Dumbledore’s orders and follow the footsteps of Harry, Ron and Hermione deep into the grounds of the Forbidden Forest. Home to an abundance of creatures, the Forbidden Forest offers shelter and protection to Hippogriffs and Acromantula among many others. It is also well known to beloved half-giant Hagrid in his role as Care of Magical Creatures professor. One of Rubeus Hagrid’s original costumes will be on display, lantern in hand, to welcome visitors through the Hogwarts Gates deep into the forest. Filled with 19 trees each with a diameter of over 12 feet, visitors will walk beneath the giant entwined roots on their journey and will even be able to control the weather using the same techniques created by filmmakers. Amongst the imposing trees, visitors will encounter a full size model of Buckbeak, which is new to the tour, and have the opportunity to bow to the majestic creature. They will see up close the incredible detail and craftsmanship that went into creating the magnificent Hippogriff. Each feather had to be individually inserted and glued by the Creature Effects team who were busy adding feathers right up until the final moment Buckbeak was needed on set for Harry Potter and the Prisoner of Azkaban. As visitors venture deeper into the depths of the forest, they will come face-to-face with Aragog, the Acromantula. Emerging from his dark lair, the enormous spider will appear before visitors along with spiderlings from his family. Created by Nick Dudman, Creature and Make-Up Effects Designer, with help from Production Designer Stuart Craig, Aragog had a leg span of over 18 feet and was even able to crawl out of a hole and deliver dialogue in Harry Potter and the Chamber of Secrets. The new, must-see expansion has been designed and built by many of the crew members who worked on the hugely successful magical film series including Oscar® and BAFTA winning Production Designer Stuart Craig, Construction Manager Paul Hayes, BAFTA winning Creature and Makeup Effects Designer Nick Dudman and BAFTA winning Special Effects Supervisor John Richardson. You will be given approximately 4 hours for the visit inside the Studios. Once booked and confirmed the booking can not be cancelled or amended.